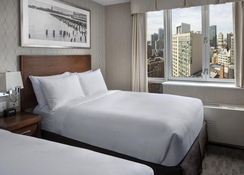 Doubletree by Hilton - Times Square South is only a few steps from Times Square and the Empire State Building, Broadway theatres, Madison Square Garden and Herald Square. The hotel is close to several restaurants, bars and has access to public transport, making it the perfect hotel for business or pleasure. 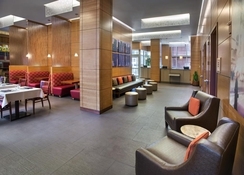 This smoke-free hotel offers facilities such as a 24-hour reception service, a hotel safe, a cloakroom, lift access, high-speed Internet access and 325 square metres of conference space, as well as a café, a bar & restaurant, laundry services and parking. 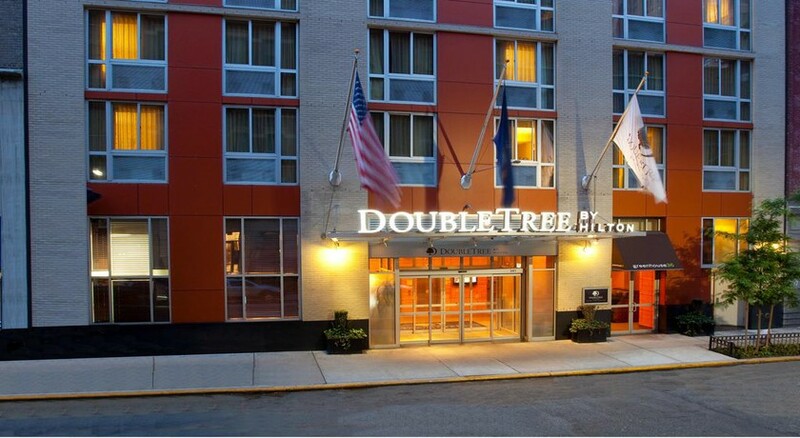 Doubletree by Hilton - Times Square South is located close to the Theatre District, and is a stone’s throw from Times Square and other such public attractions including Grand Central Station, Rockefeller Centre, Museum of Modern Art, Central Park, Metropolitan Museum of Art, Ellis Island, Statue of Liberty, Yankee Stadium and many more. The LaGuardia Airport is about 16km from the property, while JFK International Airport is 25km. Guestrooms at the hotel feature a telephone, a radio, a TV, a computer, a washing machine, iron, fridge, coffee maker, spacious bathrooms with shower, bathrobe, hairdryer, toiletries and slippers. There is also a safe and a desk. On request, rooms for disabled guests and rooms for individuals who are allergic are are also available. 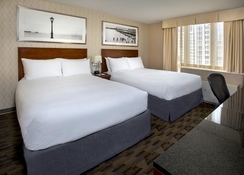 Doubletree by Hilton - Times Square South offers in-room breakfast. 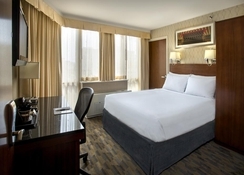 Guests may choose to enjoy either an American breakfast or a continental breakfast in the comfort of their room. The onsite restaurant offers breakfast, lunch and dinner. There is also a cafeteria that is open for a few hours. Quench your thirst with your favourite drink at the onsite bar or lounge. Inns such as the Chevys Fresh Mex, the Bread Factory Cafe and the restaurant Tick Tock Diner are only a few hundred meters away. With a 24-hour gym and many other recreational facilities at your disposal, you will not have a free minute. You also have a roof terrace where you can sit back relax and enjoy the view of the city with its iconic skyscrapers. The hotel also offers free Wi-Fi internet connection, has a souvenir shop and a newsstand. The establishment does offer wedding services. There’s a hammam and a steam room as well. You can take time out with beauty treatments in the massage and beauty area. If you are into sports, equipment for billiards, tennis, volleyball and racquet ball is at your disposal. The younger guests will find entertainment in the on-site playground.